Often referred to as the noble art, the sport of boxing enabled the Furness and South Lakeland Group to raise £10,000 at its annual boxing-with-dinner evening held at Grange-over-Sands in January. As is the tradition of the boxing committee, the proceeds are shared equally between local good causes and Masonic undertakings. Pictured from left to right at the rear, are: Peter Schofield, Tony Harrison and Jeff Moses. Front row: Olivia, Leon and Ryan. 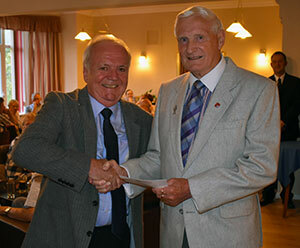 A presentation evening was held at Barrow Masonic Hall where donations were made to representatives of those concerns whose applications for a contribution had been successful. 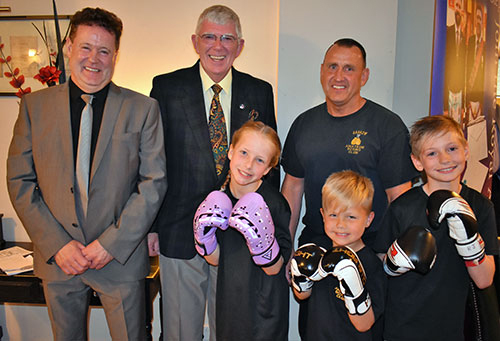 Group chairman Peter Schofield and boxing committee chairman Barrie Bray were delighted to welcome Provincial Grand Master Tony Harrison and his wife Maureen to the event. Also present were two Assistant Provincial Grand Masters in the persons of David Winder with his wife Sue and David Grainger accompanied by his good lady Beryl. Provincial Charity Steward Phil Preston with wife Lynn was likewise in attendance. A total of 14 donations were made to a wide range of organisations, most of whom took the opportunity to explain what they did and what the donation would be used for. The Ulverston Air Cadets Squadron No 2223 was represented by Sgt Ann Hillbeck who was presented with a cheque for £400 from group charity steward Richard Wilcock. Somewhat appropriately Richard had seen service in the Royal Air Force. In thanking the boxing committee for the donation, Ann explained that the money would be used to purchase a new banner for the squadron and extended an invitation to Richard and fellow former Royal Air Force officer David Grainger to attend the its official unveiling. The senior service was not forgotten as Gemma Gerrish received a donation of £400 from Barrie on behalf of the Barrow Sea Cadets. The money will go towards the updating of the female toilet facilities at the sea cadet base. Pictured left: Gemma Gerrish and Barrie Bray. Pictured right: David and Sue Winder. Group membership officer David Dryden is a member of the Barrow-in-Furness Corps of the Salvation Army. On their behalf he accepted a cheque from boxing committee secretary Kieron Mullan. David stated that the money would be used to help fund their work locally in supporting those unfortunate individuals who found themselves homeless. Kendal Boxing Club, under whose auspices the event is held, received a donation, as did Furness Catholic ABC and Barrow ABC, who both had boxers on the card on the night. Barrow ABC head coach Jeff Moses introduced three of the younger charges who gave a brief demonstration of some of their training drills. Jeff mentioned that two of his club members who had appeared on the bill at the boxing evening had gone on to bigger and better things. Featherweight Ross Cooksey has won all five of his bouts as a professional pugilist whilst Liam Conroy had recently successfully defended his English light heavyweight title. Dalton-in-Furness Lodge No 6828 secretary Paul Rose had brought along a number of birds from the Owl Sanctuary which he runs. These proved very popular, with many of the owls being happy to be held and pose for photographs. Kieron Mullan (left) and David Dryden. Other recipients of donations included the Barrow and District Disability Association who was represented by Margaret Burrow who stated that the money would be used to support the charity’s work with the disability and benefits service. Ostley House, a home for the visually impaired; Kirkby Community Centre; Furness Carers; Barrow Food Bank and the volunteer paramedics who provide ringside assistance were also beneficiaries on the evening. The remaining £5,000 was shared amongst Masonic causes. The meeting places of the lodges in the group received £200 towards their building/maintenance funds for each lodge which meet in the premises. The remaining £2,200 was presented to Tony Harrison by Richard in support of the Masonic Charitable Foundation 2021 Festival. Following the presentations, a buffet and glass of wine was enjoyed. Though the least of our considerations, when as Masons we raise money for such worthy causes, the annual donations to numerous and varied organisations cannot but help increase the profile of Masonry in the area. The fact that the local press will run a story about the evening brings home to the wider world what we are about and must surely have some impact on the negative comments made about our wonderful order. The boxing committee have raised over £200,000 over the years. That means that £100,000 has found its way into the coffers of local good causes and is something we can all take pride in. Pictured left: Ann Hillbeck and Richard Wilcock. Pictured right from left to right, are: Peter Schofield, Margaret Burrow and Kieron Mullan.